Kodiak Canvas tent company was born in the rugged Rockies. In the 15 years we have been in business, we have quickly earned a reputation for making some of the finest tents available. You may spend a little more for a Kodiak Canvas tent, but you will not find a better value. Comfortable: Being able to stand up when you put your pants on is one of the comforts many of our tents offer. You shouldn’t have to crawl into a tent on all fours either. Our Hydra-Shied™ canvas breathes, minimizing mugginess, and making your tent a more comfortable place to be. Sturdy: Be it strong wind, driving rain, or even snow, our tents will hold up to it. It’s not uncommon for us to get fan mail from our customers telling about a storm that ripped through camp, and their Kodiak Canvas tent was the only tent left standing. Made to Last: When properly cared for, one can expect a Kodiak Canvas tent to far far outlive a cheaper tents made of synthetic fabrics. Kodiak Canvas tents are made with a superior, marine-grade, 100% cotton duck, Hydra-Shield canvas. What is Hydra-Shield Canvas? It is a custom woven and treated canvas ideal for the purpose of premium tent making. It is double-fill (two threads twisted together for superior strength, durability, and a very tight weave). It has a silicone, dry-finish treatment that is watertight, breathable, and durable. It also resists mold and mildew. You will stay dry, even in a downpour! It’s okay to touch ceiling and inside walls during a rainstorm. This canvas does not leak or wick water. Unlike synthetic fabrics, or canvas with a paraffin or oil-based treatment, our canvas is breathable! This allows water vapor to escape, minimizing condensation, humidity, and mugginess. Simply put, you are more comfortable. Unlike canvas with paraffin or oil-based treatments, you should rarely, if ever have to retreat the canvas. Hydra-Shield’s silicone-based treatment is durable and very long-lasting. The canvas is strong and durable. It will hold up to the elements, and long outlive tents made with inferior fabrics. 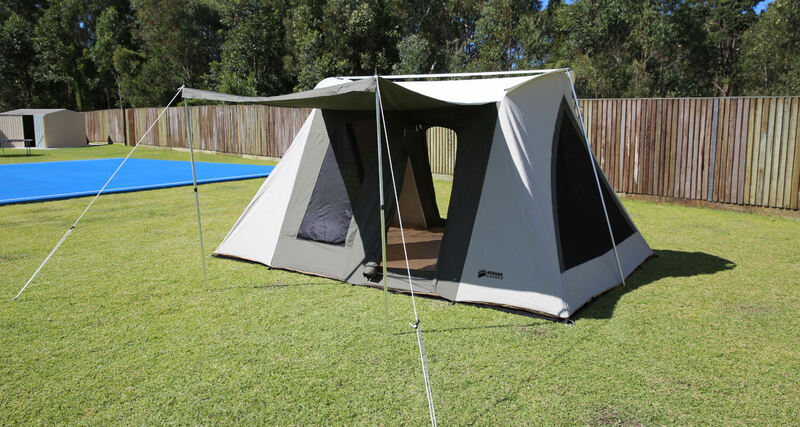 ‘Kodiak’ tents are Australia’s only 100% “Pure Cotton” – “Army Duck” Canvas tents. i.e. ; they have no ‘oil based’ products woven through it (as known as rip-stop canvas). I actually have this tent myself and can’t believe how much it ‘breathes’ and is cooler compared to others. Canvas: 100% Pure Cotton – Army Duck – Double Fill canvas. Zippers: Very old & traditional Japanese company. They produce the world’s dearest & best quality zippers.